Marian Smith grew up in Macclesfield. She has been writing stories in her head since she was a teenager but started committing them to paper about fifteen years ago. She joined a creative-writing class and is now secretary of a local writers’ group. Her main focus was performance poetry until fiction took a hold. 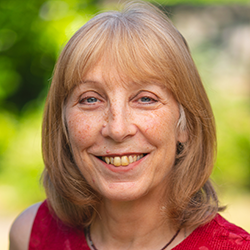 She has attended two Arvon courses and has had short stories and poems published in her writers’ group anthologies and one story published online. Until 2017 Marian worked full time as a proposal manager for an IT company. She now works three days a week and is going to give up work in September to concentrate on writing. It has taken seven years to write Answers to Absolutely Every Question. She is also working on a second novel. She lives in Warrington with her husband, and when she’s not writing, she’s tracing her family history, learning to speak Greek and is still happy to perform her poetry to anyone who will listen.